Well it’s been a busy week. I’ve recently found a fully organic supermarket in Crows Nest in Sydney called Taste Organic. It’s great. Everything is organic. Amazing quality fruit and veg, plus some great quality meat. I was wondering around the place today and saw some great looking watercress so my recipe brain started to simmer away. They have a great selection of potatoes too so an old favourite of mine is crushing up new potatoes with a bit of salt, pepper, butter and then just stir through some fresh watercress and let it wilt in the residual heat of the potatoes. It’s great. An excellent addition to bangers and mash (recipe here) or in this case great with some amazing Organic Pasture raised lamb from Tasmania. They had these nice mini roasts which were essentially a butterflied leg of lamb cut down a bit to about 500 grams and then wrapped with butchers string. I then found this amazing looking broccolini and a nice courgette and then thought about a tasty red currant and rosemary sauce. An old classic but a good one. 400 grams of lamb. You can use any cut you like really. Ok so pop the oven on about 180 and let it warm up. Meanwhile pop the new potatoes on in some salted water and bring to the boil. Now get a frying pan on a high heat and let it get really hot. While it’s heating up get your lamb and rub some extra virgin olive oil over it and season with salt and pepper. Pop in the frying pan and brown off on all sides. Now pop the lamb into a small oven roasting dish add 2 cloves of smashed garlic, a sprig of rosemary, a few sprigs of mint and about 100ml of water. Cover with foil and pop in the oven. Cook for about 30 mins. After 30 mins slice the courgette lengthways into about 3 slices. Pop on an oven roasting tray along with the broccolini and drizzle with olive oil and season with salt and pepper. 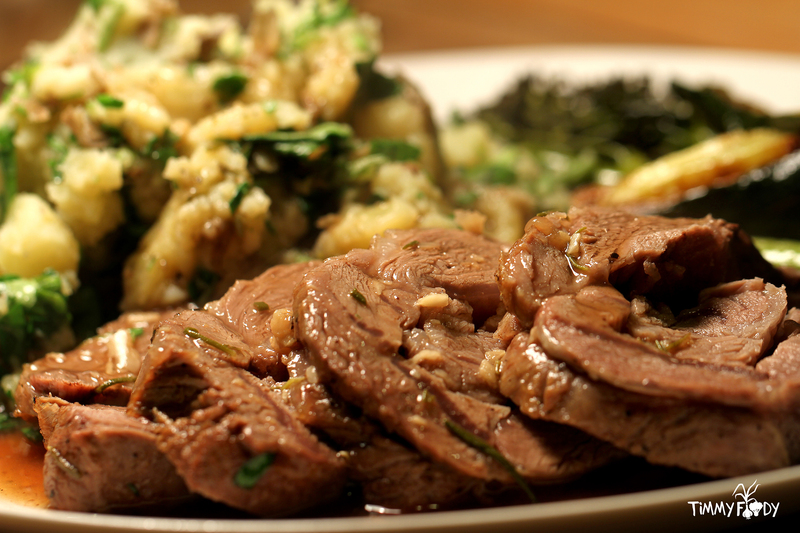 Pop this in the oven on the top shelf and move the lamb on the bottom shelf. Give it 15 mins then remove the lamb and pop to one side. don’t remove the foil, just leave it covered for now. Now turn up the oven to about 220°C so while the lamb is resting the courgette and broccolini can brown off in the oven a bit. While this is happening, strain the potatoes, pop them back in the pan, add a knob of butter and some salt and pepper. Pop the lid on and give it 1 min for the butter to melt. Remove the lid then crush yup the potatoes with a masher or fork. Don’t completely mash this, we just want to smash them up a bit. Now add some roughly chopped watercress, pop the lid back on and let the watercress wilt in the heat of the potatoes. Give it 2 mins then mix up well. Taste and add more salt, pepper or butter if you’re feeling naughty! Now Remove the lamb from the dish and pop on a chopping board to carve. We want to just give this 2-3 more mins to rest so we’ll knock up the sauce. Grab a small sauce pan. Pour the liquid that was in the dish you roasted the lamb in and smash up all the garlic. Add 2 healthy teaspoons of the red currant jelly and a teaspoon of freshly chopped rosemary. Add a good few grinds of black pepper. Mix up well and we’re done. It shouldn’t be a thick sauce just like a thin sauce. I think fancy people would call that a Jus. Sorted. 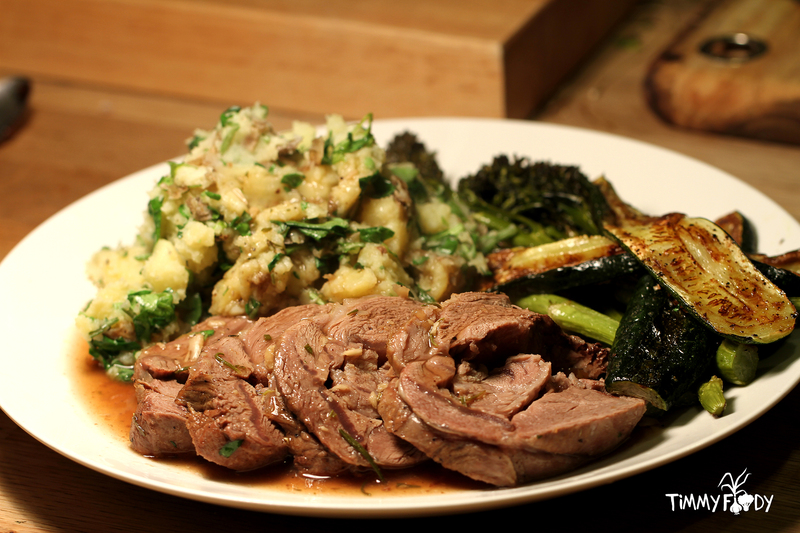 Carve the lamb into slices, Add a nice mountain of the mash and the roast broccoli and courgette. Drizzle over the sauce and we’re done. I like to have a little spoonful of mint jelly on the side too. bosh.